This test is a wheelchair version of the beep test, by Vanderthommen et al. (2002). purpose: to evaluate physical fitness and predict peak oxygen consumption of wheelchair users. pre-test: Explain the test procedures to the subject. Perform screening of health risks and obtain informed consent. Prepare forms and record basic information such as age, gender, test conditions. Perform an appropriate warm-up. See more details of pre-test procedures. 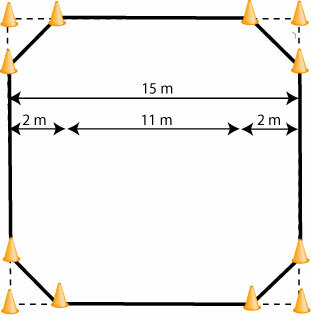 test layout: An octagonal course is marked out using cones (see diagram). The course is basically a 15 m x 15 m square, with each corner modified to create a 2.83 m long turning zone. The four main sides of the octagon are 11 m long. The corner zones avoid the necessity to make a sharp 90 degree turn. procedure: The initial wheeling velocity is 6 km/hr, which is increased by 0.37 km/hr in one minute stages. A beep signifies when the subject has to be within the turning zone. The test is stopped if the subject is unable to reach the turning zone on three consecutive occasions. scoring: The score is the number of exercise level achieved before the participants are unable to keep up with the recording. target population: this is a test of aerobic fitness for people in wheel chairs. advantages: this test is more cost-effective and easier to administer than the alternative laboratory fitness tests that are usually required to test the fitness of wheelchair users. disadvantages: As with the running beep test, practice and motivation levels can influence the score attained, and the scoring can be subjective. Wheelchair skill and technique may also affect the level achieved. The subjects are allowed to use their own personal wheelchair and are free to choose the direction of rotation for the test (clockwise or counterclockwise). It is also possible to simultaneously test four subjects if they choose the same direction of rotation for the test. test reference: Marc Vanderthommen, Marc Francaux, Cédrik Colinet, Cédric Lehance, Claude Lhermerout, Jean-Michel Crielaard, Daniel Theisen, A multistage field test of wheelchair users for evaluation of fitness and prediction of peak oxygen consumption, Journal of Rehabilitation Research and Development, Dec 2002, Volume:39 Issue:6 Page:685-692. Hartung GH, LaHy DA, Blaneq RJ. Comparison of treadmill exercise testing protocols for wheelchair users. Eur J Appi Physiol Occup Physiol 1993;66(4):362-65. Davis OM. Exercise capacity of individuals with paraplegia. Med Sci Sports Exerc 1993;25(4):423-32. Franklin BA, Swantek KI, Grais SL, Johnstone KS, Gordon S, Timmis GC. Field test estimation of maximal oxygen consumption in wheelchair users. Arch Phys Med Rehabil 1990;71(8):574-78. Vanlandewijck YC, Daly DJ, Theisen DM, Field test evaluation of aerobic anaerobic, and wheelchair basketball skill performances. Int J Sports Med 1990;20(8):548-54. Vinet A, Bernard PL, Poulain M, Varray A, Le Gallais D, Micallef JP, Validation of an incremental field test for the direct assessment of peak oxygen uptake in wheelchair dependent athletes. Spinal Cord 1996;34(5):288- 93. Rhodes EC, McKenzie DC, Coutts KD, Rodgers AR. A field test for the prediction of aerobic capacity in the male paraplegics and quadraplegics. Can J Appl Sport Sci 1981;6(4):182-86.